We were docked at a different wharf this time. Some folks were disgruntled (well, really, there are always some folks disgruntled) because it was a good walk to the subway & you had to go elsewhere to buy two day subway passes. But we actually liked this one better because there was a good view of the city from the ship & there was a shuttle bus to a convenient (for us) location in town. Today we decided to visit the Sultan Mosque, which was closed the last time we were here, & do some shopping on nearby Arab Street. So we boarded the shuttle bus for a short drive to the drop off spot at a shopping mall in town. It was only about a 15 minute walk from here to the mosque, but we managed to make it into an hour walk by turning the wrong way & finding ourselves next to the Singapore Flyer Ferris wheel instead of the mosque. But eventually we found ourselves walking along the interesting ethnic streets near the mosque. The mosque was closed for another hour for midday services so we spent that time scoping out the stores on Arab Street. This is a small street across from the mosque that is lined with textile stores, each stuffed to the gills with every kind of textile you can imagine, many at bargain prices. Some of the stores also sell finished clothes, rugs & other middle eastern items. It is extremely crowded & hectic and after a few minutes it becomes difficult to pick out the patterns you actually like from the myriad others surrounding them. As you walk past a shop, each of which is open to the street with goods displayed on both sides of the sidewalk, the shop owners call out and invite you to come in & peruse their wares. It’s not our favorite shopping environment, but we did not come away empty handed. Then it was back to the mosque. The Sultan Mosque was built in the 1920’s on the spot where a mosque had stood since the 1820’s. Sir Stamford Raffles had made a deal to recognize as sultan the brother of the sitting local sultan & they agreed to this spot for a mosque and a Muslim district. To enter the Sultan Mosque we had to take off our shoes & leave them in a rack near the door. We were appropriately dressed (long sleeves & pants), but visitors wearing shorts or tank tops were provided with a long robe to wear inside. After leaving the mosque we decided to walk to Fort Canning Hill & look for a lunch spot along the way. At this time of day, mid afternoon, it was hard to find a place serving lunch, but we finally found a German restaurant that suited. This is a very cosmopolitan city with every kind of cuisine available. Just before we reached the hill we passed the beautiful National Museum, with a huge India Rubber Tree sitting out in front. Originally built in 1887, this was the National Library and Museum until 2004, when the National Library was moved to a new location (which we visited in 2016). We did not have time to visit the museum (maybe next time), so we walked on to Fort Canning Hill. We were happy to see a huge escalator up the side of the hill, but it turned out to be broken. So we had to treat it as a staircase; much less satisfactory. Fort Canning Hill has a long history. In the 14th century it was probably the seat of a Malay kingdom, and it became known as Forbidden Hill because the last ruler was thought to be buried there. It was forbidden to climb the hill. When the British came in 1819 they unhesitatingly ascended the hill and erected a flagpole, then a house for the British Resident. None of the locals would accompany them up Forbidden Hill so they took Malays up with them to build the house & renamed it Government Hill. In 1861 a fort was added & the fort & its hill were named after the Viceroy of India, Viscount Canning. In the 1920’s a barracks was built, used today as an arts center, and an underground complex was built in 1936 to house the British Far East Command. Called the Battle Box, this is where the decision was made to surrender Singapore to the Japanese in 1942. The Battle Box was our main objective on the hill, but it was closed by the time we got there. Among the things we did see on the hill were an old Christian cemetery, which operated from the 1820’s until the 1860’s. The most interesting graves were built into a long brick wall leading up to the Arts Center. There is a sculpture garden on the hill and some interesting flowers, a few of which are included here, but this is only a small taste of the flora you can see in the next episode. We walked back to the shuttle stop and rode back to the port. The night brought another beautiful view of the lighted city from the ship. And so ended our first day in Singapore. In Vietnam, as in most of Southeast Asia, motorbikes are kings of the road. You see whole families on a single motorbike: parents, children & babies. People use them to move surprisingly large things too. We once saw someone on a motorbike dragging a 12 foot ladder behind him. Another interesting thing here is that many people cover up their whole bodies and faces despite the withering heat and humidity. We were told that this is to prevent suntan because pale skin is considered more attractive here. If you have ever seen the movie “The Invisible Man,” that will give you some idea of how this can look. Saigon is a huge city with many millions of people. There is construction everywhere, from a project of high rise residential buildings across the river called “New Town” or “New Saigon” to a subway in the middle of town being financed partly by the Japanese. The construction downtown actually made it somewhat difficult to get around. The bus dropped us off in front of the tallest building in Saigon, near where the broad boulevard Nguyen Hue meets the river. This boulevard has streets on either side of a very broad pedestrian walkway. It was still dressed up for the lunar new year, but was mostly empty on the day we visited. We walked up the boulevard, past the Rex Hotel where the American military press briefings (known to journalists as the “Five O’Clock Follies” because they were not easy to believe) were held during the war, to the Hotel de Ville. Built by the French in 1908 as the center of city administration, today it houses the People’s Committee responsible for governing Saigon. It is quite beautiful and is fronted by a park with a statue of Ho Chi Minh in the middle. The park in front of the Hotel de Ville has many colorful flowers. So here are a few. We walked over to see the Opera House, whose official name is the Municipal Theater. It was built by the French in 1898 and has elaborate carved stone details & fountains on the grounds. It was closed to the public but we were able to see the lobby through the glass door. In front of the Opera House was a promotion for a play consisting of a whole lot of bamboo fish traps attached to a bicycle. Walking on, we came to a small park full of flowers and passed a monument in a tiny park commemorating something that happened on Christmas Eve in 1964, but we can’t read Vietnamese so we didn’t know what that was. We have since learned that this was the bombing of the Brinks Hotel in Saigon by the Viet Cong. It appeared from signs we saw (again, we can’t read Vietnamese) that the city was celebrating the 50th anniversary of the Tet Offensive that was a major turning point in the war. Although many more Vietnamese were killed than Americans in that battle, American confidence was shaken by the Viet Cong’s ability to invade the American embassy in Saigon. Tall sculptures of lotus blossoms decorated a number of street corners. We don’t know whether these were there for a special purpose or just normal. We walked around a little, visiting some stores & getting lost until we found ourselves back by the river. The streets of the city were pretty interesting in themselves. Finally discovering the correct route (we had turned in the direction opposite from where we wanted to go), we walked up to the Post Office, built by Gustave Eiffel in 1891. The outside is bright yellow with carved stone decoration, including busts of famous European artists and philosophers. There is much hustle and bustle outside with street vendors selling, among other things, very colorful folded cards that open up like children’s pop-up books to display a Vietnamese building or scene. 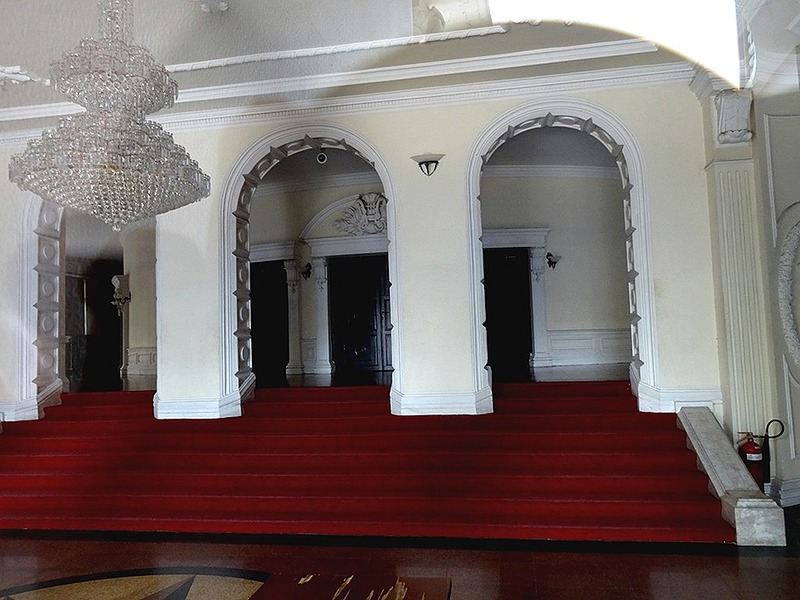 Inside is a vast hall with iron pillars and a portrait of Ho Chi Minh displayed prominently on the wall in the back. Its really an interesting building. Across the street is the Notre Dame Cathedral, built by the French in 1880. It looks like brick but it is actually made of red tiles from Marseilles covering granite walls. It appeared to be undergoing renovation as it was mostly covered in wide scaffolding. Down the street to the right of the post office is the building where, we were told, the last American helicopters left Vietnam as the Vietnamese army was closing in on the city. It is the subject of a rather iconic photograph showing the desperate people left behind. We had done a lot of walking on a hot & humid day, so we stopped for a late lunch in a restaurant next to the post office. We had pizza & beer, very refreshing. Unfortunately it was open on three sides & not air conditioned. After lunch we walked down to the Ben Thanh Market, built in 1913 by (yes, again) the French. Inside are hundreds of vendors in booths divided largely by subject matter: clothing aisles, food aisles, etc. It is very crowded & busy and as you walk down an aisle each vendor jumps up to point you to their wares (as if you couldn’t see them yourself). Lots of bargaining going on and the shops have spilled over onto the surrounding streets. After that we met our bus (having to fend off dozens of street merchants who kept approaching us as we waited) and drove back to the ship. It was a shame we had only one day in Vietnam this year. On March 9 we were scheduled to go on a HAL excursion to Lantau Island In the New Territories, a part of Hong Kong that is somewhat closer to mainland China. So, after the long trek through the cruise terminal, we boarded the bus & set out. Our first stop was rather useless. It seems that about 10 years ago China completed the Tsing Ma Bridge, one of the longest suspension bridges in the world, between Hong Kong & Lantau. Before crossing the bridge we stopped at a sort of park that was built as a visitor’s center for the bridge. Why would you want to go to a viewing station for a bridge? That’s a good question, to which we never got a reasonable answer. We saw some nice flowers in Hong Kong & many of them were in this park. So here is a selection. So we crossed the bridge and entered Lantau Island. After the crowded skyscrapers of Hong Kong it is rather a surprise that Lantau has so much undeveloped green area. And to keep it that way they have instituted strict environmental regulations. Most notably for us, only vehicles certified as meeting Lantau’s environmental standards are permitted to drive there. This meant that shortly after entering the island we had to stop and change to a bus that satisfies the regulations. They have begun work on a tunnel under the bay between Kowloon & Lantau, which is expected to make travel there much easier. Lantau was pretty much a backwater until the new airport was built there in 1998 (the old one was where our ship docked this year). Today it also houses the Hong Kong Disneyland, in addition to the attractions we visited while there. Our first stop was to visit Tai O village, one of the oldest fishing villages in Hong Kong. It was once the center of Lantau’s thriving salt trade with mainland China. Today it is a regular stop for visitors to Lantau but still engages in fishing and has several good seafood restaurants. It is situated on both sides of a channel between Lantau and a smaller island; once you had to cross on a boat but today there is a bridge. After crossing the bridge onto the island side you come shortly to what our guide told us is the Kwan Ti temple. Built around 1500, it is dedicated to the god of war. Next to it is a tiny temple dedicated to the god of sailing that looks just as old. The roof of the Kwan Ti temple is lined with what looks like colored ceramic figures of beasts, including a lion and a bird that may be a goose, along with a number of people who may represent former residents of the town. They are looking very good if they have been outside on the top of a building for 500 years of squalls and typhoons. We spent some time walking up and down the streets of the village. There were a number of shops open to the street (lots of tourists come here), including several food shops, some with blowfish hanging from the awning & some with live fish that can be purchased and carried to a restaurant for preparation. Leaving Tai O we drove to the Tian Tan Buddha, a massive structure known colloquially as the Big Buddha. It is cast in bronze and is well over 100 feet high and weighs about 250 tons. Until recently it was the largest seated bronze Buddha in the world but our guide told us that a bigger one was opened recently. We were expecting to be able to walk up the 268 steps to the Buddha, sitting on a bed of lotus petals, but apparently we were behind schedule since they drove us to the top instead. On the walkway below the Buddha are large bronze sculptures of three maidens making offerings to him. The Buddha is on top of a mountain, so there are some great views from there, including one of the Lin Po Monastery below, where we had lunch. We drove down in the bus (boo) & walked along a promenade lined with statues of old Chinese generals toward the Monastery. We did not get to tour it, but we did eat a very good vegetarian Chinese lunch at a restaurant in the Monastery. After lunch we walked back up the promenade to a commercial area of restaurants (Starbucks) & souvenir shops called Ngong Ping Village. Its not really a village at all, but it is the terminus for the cable car to Tung Chung, the town near the airport. We climbed in the gondola, which is suspended from a cable very high in the air. It took about half an hour to go over the top of a mountain and down to Tung Chung. As we left we had a nice view of the Big Buddha sitting on top of its mountain and as we neared the end we had a gut-wrenching but beautiful view of the airport far beneath us. One woman in our gondola kept her eyes shut the whole time! We transferred to the bus at Tung Chung and drove back to the cruise port. On the way we passed a tall building under construction covered in bamboo scaffolding, which is common here (take a closer look at the scaffolding in the first Tai O picture), as is wash hanging from the balconies of high rise residential buildings. Our guide told us that because electricity is quite expensive in Hong Kong people wash their clothes in machines but hang them outside to dry for free. We sailed away at sunset and passed a stilted village on the other side of the harbor. After dinner we went to bed as the ship sailed south toward Vietnam. Conditions were pretty poor for a visit to Hong Kong. It was cold, windy & drizzly. Kai Tak is a terrible cruise port; you have to walk about a mile (really!) from the ship to reach the bus terminal. Then once the shuttle bus finally leaves it is a half hour drive through nasty traffic to the drop off at the Peninsula Hotel, near where we docked last time & the Star Ferry Terminal. And once we arrived there our bus had to circle the block three times before finding a place by the curb where we could get off. So, after all that, you can start your visit to Hong Kong. We were told that the building on the left in the picture below is the tallest in Hong Kong, which is saying something because Hong Kong has more skyscrapers than any other city in the world. We wanted to take the HOHO bus around Hong Kong island, which required us to take the Star Ferry across the bay. The Star Ferry is a venerable institution in Hong Kong, begun in 1898, & still costs well under a dollar for a ride. Well worth it, since its also fun. We crossed the harbor & boarded the two tier bus, taking seats with a view on the top. The HOHO runs a circular route through the city, allowing you to see a great deal as you go & to get off at any stop you would like to explore on foot. We passed the tram station for going up to Victoria Peak (bad day for this because it was covered with clouds), the botanical garden, the mid level escalators that climb halfway up toward the peak, all of which we visited last time. It continued through Happy Valley which contains a famous race track & out past several bays and the Ocean Park amusement park. We finally reached the first of two objectives for the day, a remote spot called Stanley. Today it is a high priced residential area, but in the 19jth century it was a fishing village and a base for pirates. Stanley has a large bay that was beautiful even on a dark & cloudy day. Most people come here to visit the Stanley Market, a crowded maze of stalls selling every kind of Chinese souvenir you can imagine in a large range of prices. We re-boarded the bus & headed for our second destinatiion, Aberdeen. On the way we passed Repulse Bay, once a pirate hangout that got its name when the British Navy drove them away. Its beach has been a popular since the 1920’s and on nice weekend days it may have tens of thousands of bathers (but certainly not today!). On the hill above is a large curvy blue residential building with a large hole in the middle that was dictated by Feng Shui, the Chinese system of architectural arrangement. Aberdeen is a town built around a harbor that was once crowded with Chinese junks on which families lived and sold fish, flowers and other items. Today it has a lot of boats parked in rows but it doesn’t appear that many are actually living on board. We were told that most of the families who once lived on the boats here were moved into the residential skyscrapers lining the harbor, which house some 60,000 people. We toured the harbor on a sampan that was decorated profusely with plastic flowers and lanterns. We spent about 20 minutes sailing around the harbor, up and down the rows of boats. Are any of these house boats? We don’t know. It was raining so there was no activity on the boats. We don’t know what it would be like on a nice day. This is a very active fishing harbor, bringing in about a third of all the seafood in Hong Kong. Two huge floating restaurants sit in Aberdeen harbor, one called Tai Pak and the other called Jumbo. We were told that these restaurants are an experience but that the food has gone downhill in recent years, although that on the top floor of the Jumbo is making a comeback. Our sampan sailed around these restaurants. They are brightly lit at night, but of course we weren’t there at night. We re-boarded the bus to go back to the pier. It had become very cold, windy & drizzly while we were at Aberdeen, so we decided to sit inside rather than on top. Unfortunately the bus was quite late & by the time it got to us the inside was full, so we had to sit on top. The cold wind made for a very unpleasant ride, but we made it (without getting sick, surprisingly). We crossed back to Kowloon on the ferry & rode the shuttle bus back to the ship. That evening there was a Chinese cultural show. It was pretty much the same one we saw here two years ago but it was still good & fun to watch. The highlights were the dragon dance & the fellow who changes faces (masks) so quickly you can’t see it happening. We were told this is a highly respected art in China and the one we saw is one of the best. So that was all for day 1, dampened by weather and shortened by the remoteness of the cruise terminal (and a substantial delay in the port officials clearing the ship so passengers could disembark in the morning). Hong Kong puts on a great light show at night, with lasers and changing lights on buildings, but that is in the central part of town where we docked last year and we couldn’t see it from this year’s berth. But we went out on deck and this part of Hong Kong across the harbor was still pretty spectacular at night. As we headed for bed we were hoping for better weather for day 2 when we would be taking a HAL tour. March 6 found us still in Manila. After exhausting ourselves walking in the humid heat on our first day we were somewhat relieved to be going on a bus excursion today. Unfortunately, the excursion turned out to be less interesting than we had hoped. Leaving the port, we had a pleasant if uneventful ride through the countryside. We stopped at a fruit stand in the mountains and had an opportunity to taste some local fruits, including very sweet bananas about 4 inches long and small pineapples that were very sweet & juicy. Our destination was the village of Tagaytay, a mountain resort area about an hour from Manila that attracts Manilans because it is a good bit cooler. The primary attraction here is the Taal volcano, the smallest volcano in the world. It sits in a lake formed by the caldera of a much larger ancient volcano, so it is a volcano inside of a lake inside of a volcano on an island in the ocean. It is possible to visit the volcano: there is a hiking track up the hill to the caldera from a small village on the coast nearby. But all we were able to do was look at it from the hill behind the hotel where we ate lunch (a pretty good brunch with local food). At the foot of the mountains on our side of the lake was a fishing village with a lot of fish traps offshore. There were some nice flowers on the grounds of the hotel, where we strolled after lunch. So that was it. We left Tagaytay & its tiny volcano & headed back to Manila, where we had a brief drive through Intramuros before returning to the ship. A relaxing day, if not too exciting. While the day trip was a little disappointing, the sail away from Manila was anything but. The sun was beginning to drop in the sky as we left & part of the city was covered by a dramatic gray cloud. There were double outrigger fishing boats in the water nearby, apparently heading for home, as we sailed away from the dock. As we sailed across the huge harbor the sun shone down from behind a cloud onto Bataan (once the location of a notorious Japanese prison camp). We sailed out of the bay between Corregidor and Bataan. Unfortunately Corregidor is much smaller & lower, so we were unable to get a good picture of it before the sun went down. We left the harbor after the sun set & sailed on to our next adventure.